Intermittent fasting (IF) is a diet form that gains more and more popularity. In the today's blog, I want to give an overview of the scientific base around IF and evaluate the literature out there. IF means to fast for 16-20 hours and consume all calories in an eating window of 4-8 hours. The fasting period can also be extended. The way I am doing it is, to skip breakfast and start with lunch as the first meal. When I was advertising this form of diet to friends they mostly replied that "they would die of hunger" when they skip breakfast. And yes, the first days are hard as the body have to get used to it but after that period - which can be easily attacked by drinking water, coffee or tea every time the hunger strikes, the morning hunger disappears. The first observation was that ghrelin levels seem to rise and fall independently of any food intake and seem to be dependent on the time of the day - meaning the time the body is used to eat. And second, during the fast, the average ghrelin levels became lower despite the fact that the people did not eat for a prolonged time . This shows us that our appetite is less controlled by the fact whether we eat but much more by how we are used to eat. And the time we are used to eating is nothing more than a habit. A habit the body can adapt to. This first study is backed up by another one published in the same year . They also showed that ghrelin levels are lowest in the morning. The time when the subjects have not eaten for the longest. In six different animal studies, researchers fed the animals in a time window of <9 hours, meaning they fasted for at least 15 hours a day [3,4]. They found a significant reduction in body weight in the animals on IF compared to the control groups and even more interesting is that especially the visceral body fat was extremely reduced (>40%). Visceral fat is the fat packed between the organs, which is associated with diabetes and inflammation. IF were tested on a low and high-fat diet and both seem to have equal benefits compared to the non-time restricted diets (Figure below). Furthermore, total cholesterol and triglyceride levels went down, reducing the risk for cardiovascular diseases. Intermittent fasting (here RF) reduces body weight increase on a low-fat (LF) and high-fat (HF) diet . A randomized crossover study in humans looked into the difference between a one meal a day (OMAD) diet to a three meals per day diet over a time period of 8 weeks . The volunteers consumed the same amount of calories per day as the "normal eating" group only that they had to eat all in a 4 hour time window in the early evening. The OMAD group lost on average 0.6 kg body weight while the other group gained 0.8 kg. 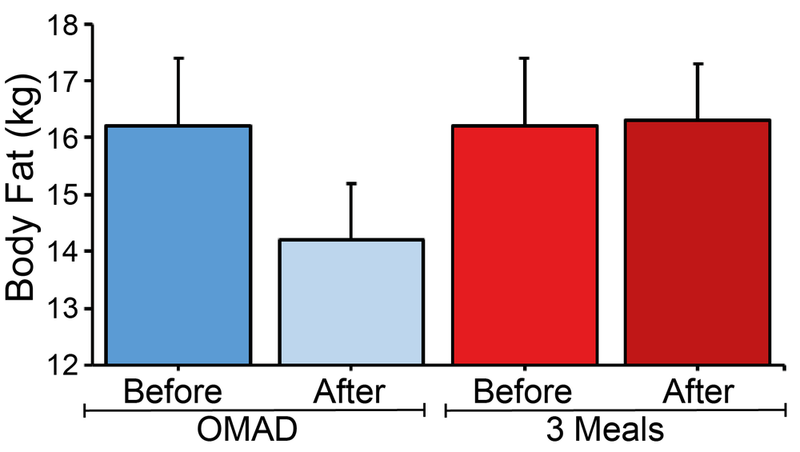 Even more interesting, the OMAD group reduced their fat mass by 2 kg on average and could increase their fat-free mass by 0.8 kg, which basically means that they gained muscles. These results show us that OMAD has the potential to build muscles while simultaneously losing fat! A hormone which is critical for fat loss and muscle building is the human growth hormone. It further is involved in cell reproduction and regeneration, cognitive functions and is even implemented into our emotional well-being. Many people who work out fear that they lose their hard-gained muscles during their fast. Contrary to what you might expect, it seems to be the opposite: In 1988, a group from the University of Virginia Medical School looked into the connection between growth hormone secretion and fasting and found that the concentration of the human growth hormone more than doubles after just one day of fasting and continues rising even after five days without any food . It is like the body wants to protect his muscles. Evolutionary it totally makes sense to me as our ancestors fasted regularly for a prolonged time and couldn't afford to lose muscle in case they need to hunt or are hunted by bigger animals. I cannot emphasize enough the importance of keeping your inflammation levels low. Elevated inflammation levels are associated with Atherosclerosis, Alzheimer's disease, Diabetes, Obesity and many more. To check if IF has an impact on inflammation levels, a research group from Isreal looked into the change of inflammatory markers in the body of mice after they restricted their feeding time to 8 hours a day and compared the group of mice to mice which had access to food at any time. They found that many pro-inflammatory proteins were lower in mice on IF than in the control. The inflammatory proteins (cytokines) IL-6, tumor necrosis factor-α, nuclear factor κ-B, IL-1α, and IL-1β, while in contrast the anti-inflammatory proteins cytokine IL-10 was shown to be increased . Probably the most dramatic difference was seen in the blood levels of cortisol, our stress hormone. The participants who did OMAD for 8 weeks exhibited a huge difference in blood cortisol levels . In fact, they reduced their cortisol levels by half! Ketosis is one of the forms how our body can supply itself in times of "starvation". Usually, we burn glucose as our preferred form of energy. Nevertheless, our body can switch to the use of ketone bodies as means of energy. This happens when our glycogen storage in the muscles and liver are used up and we cannot provide the body with enough glucose. This state can be induced by either the ketogenic diet, which is defined as a high-fat and low-carbs diet or by fasting long enough so that the bodies storage of glucose is empty. Our cells can basically produce three different form of ketone bodies: Acetone, acetoacetic acid, and beta-hydroxybutyric acid. The scientific opinion on the health benefits of ketosis is throughout positive. In brief: the ketogenic diet was successfully used to treat overweight and diseases like diabetes, cardiovascular diseases, cancer and in particular neurological disorders . For a more detailed insight, have a look at my blog about this topic. Fasting for a prolonged time of 16 hours and more can be enough to put the body temporarily into ketosis and in turn benefit from the ketone bodies. Certainly, this depends on how full your glycogen storage is and on your activity level. Researchers showed that ketosis improves diseases related to brain dysfunctions and some studies indicate that a ketogenic diet can improve memory functions . The one thing I probably like the most about IF is that it boosts your productivity. Once I wake up, I turn on the coffee machine, jump under a cold shower and 5 minutes later I can start working. No need to "waste" time preparing and eating breakfast. And especially, if you want to have a healthy breakfast, it needs a little time to prepare. Another advantage is that I'll not snack before lunch. When I was still eating cereals for breakfast, I always experienced a strong hunger feeling not even 2 hours after. Further, avoiding sugars in the morning don't let your insulin peak and drop - meaning you will not become sleepy. Starting with a high fiber, high fat, high protein, low carb lunch has the same effect. It keeps you productive and holds tiredness at bay. Newest studies indicate that fasting improves microbial diversity and makes our intestines less permeable to pathogens and toxins (averts a leaky gut). If you are interested in how IF fasting can influence your microbiome, check out my blog on this topic.